Airtight - jessandmarshallnapierfanpages jimdo page! Airtight ist ein Film aus dem Jahr 1999. In der Zukunft ist eine dramatische Situation. Die Erde hat keine Luft mehr. Die „Air Force“ muss nun die Welt retten. Marshall Napier spielt eine Rolle namens Norscrum in dem Film. Airtight is a movie from the year 1999. There is a dramatic situation in the future. Earth has run out of air. It is up to the “Air Force” to rescue the world. 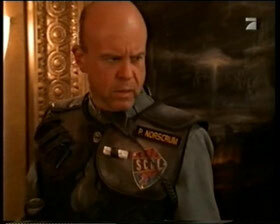 Marshall Napier acted a character named Norscrum at that movie.